Download Video to DVD Burner for free trail. No Time limits! No feature limits! Fully functional! 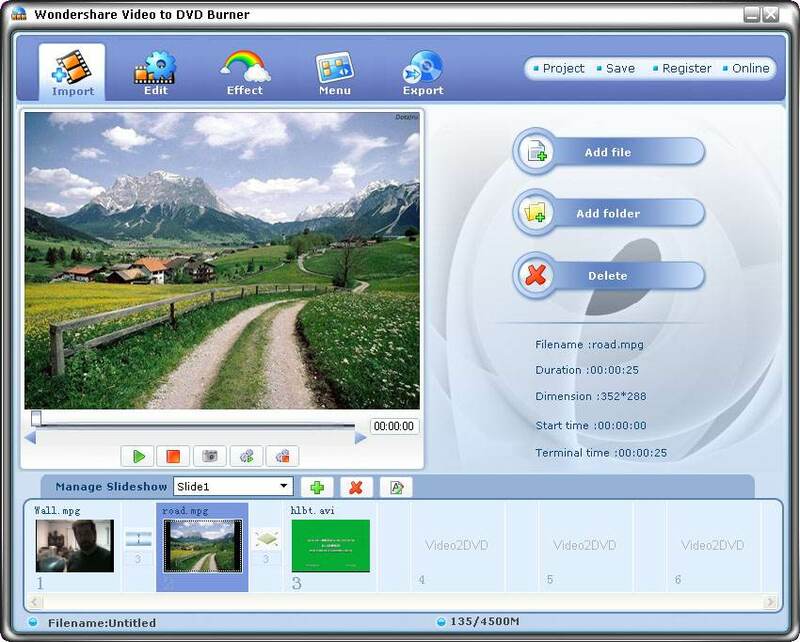 Wondershare Video to DVD Burner is fast video-editing and DVD-authoring software. In just five steps, easily convert and burn all popular video files directly into DVD movies so that you can watch them on TV. 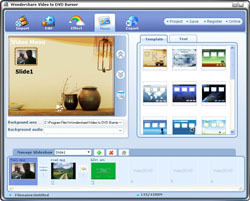 It offers a wealth of tools for more hands-on editing, including video trimming, producing your own soundtracks, menu templates and in addition to apply fancy transition effects between clips, which help users produce professional-looking movies and play them on almost any DVD player. Support all popular video formats such as MPEG, m1p, m2p, DAT, MPEG, MOV, AVI, WMV. Fast convert AVI to DVD, WMV to DVD, DAT to DVD, MOV to DVD with amazing quality. Easily edit video and enhance with text, music and voice-overs. Trim your video by selecting the beginning and ending points of the needed segments. Select the transitions between clips and DVD menu templates. Instant transfer video to DVD with built-in DVD burning. Supports 4:3 and 16:9 video aspect ratio, and burn either DVD disc or ISO file. Trim your video by selecting the beginning and ending points. Burn video files directly into DVD movies with amazing quality.